The Rideau Corridor is host to several interesting villages, towns and cities. Anchored in the north by our nation's capital, Ottawa and in the south by the limestone city of Kingston, the Rideau Corridor is home to farms, cottages, artists' havens, interesting shops, pastoral landscapes, historic locks, sparkling lakes, tranquil rivers, and much more. 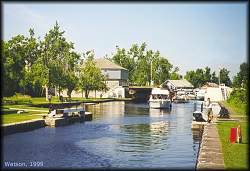 Whether you come by boat along the Rideau Canal Waterway, or by vehicle along the Rideau Heritage route, please take some time to visit some of our interesting towns and villages. Follow the motto of Perth to "make haste slowly." This community got its start in 1860 when Moss Kent Dickinson and his partner Joseph Currier built a saw mill and a grist mill. It was Dickinson who in 1864 named the new village "Manotick" after the Ojibwa word for Long Island. An interesting feature of the village is Dickinson Square Conservation Area which hosts Watson's Mill , the F.E Ayers Building and Dickinson House. The story of the mill is one of love and tragedy, well worth a visit to find out more. Originally known as Wellington, this community came about with the building of the Rideau Canal. It has maintained its quaint rural charm and has several lovely heritage homes. A claim to fame for Kars is that wood from Kars was used to build furniture for the Titanic. 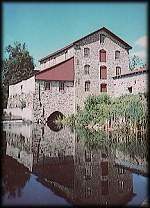 First known as "The Branch" for its location on the South Branch of the Rideau River (changed to Kemptville Creek in 1908), it became known as "Clothier Mills" for Lyman Clothier and his four sons who settled here after 1812. It was renamed "Kemptville" in 1828 after Sir James Kempt, governor-in-chief of British North America. Kemptville is home to the internationally renowned College of Agriculture (now part of the University of Guelph). Crown land near the Ferguson Forest Centre, bordering the entire west shore of Kemptville Creek, offer several kilometres of hiking trails. Kemptville Creek is navigable by shallow draught boats for about 3 miles (5 km) to the town. Limiting depths are 3 feet (1 m) at datum and bridge heights of 11 feet (3.5 m). The town offers a variety of stores and restaurants, and travellers can obtain supplies from the several businesses fronting Highway 43. Burritts Rapids was one of the first settlements on the Rideau, predating the Canal itself. In 1793, Colonel Stephen Burritt, his three brothers and their wives floated down the Rideau River on a raft, looking for a spot for a settlement. When they got to the rapids, they saw the potential for a mill. The story goes that, soon after settling there, they were dying from a fever when they were rescued by a band of local natives, nursed back to health, and even had their crops harvested for them. Ever after, the Burritt home was a welcoming place for natives travelling the Rideau. When Colonel By came through in 1826, Burritts Rapids was a thriving village with several businesses. The village, like the Rideau Canal itself, lost its commercial importance at the start of the 20th century. To learn more about this charming village and the countryside, visit the lockstation and take a stroll down the Tip-to-Tip Trail. Known as "The Jewel of the Rideau", it was Roger Stevens who first built a mill here at the site of the "Great Falls" in about 1790. In 1793 William Mirick, a millwright from Massachusetts took over the mill and by 1802/03 had settled with his family on this spot, laying the foundation for the future village. Today Merrickville is a thriving community, renown for its many interesting crafts and arts shops and well maintained stone buildings. It is a wonderful place to spend an afternoon browsing the stores and admiring the architecture of the town. Merrickville is home to the famous Blockhouse, which sits in defence of the local locks. Adjacent to the Blockhouse you will find The Depot, the retail outlet and Rideau interpretation centre of Friends of the Rideau. This is the largest community in the Corridor, home to the Rideau Canal Visitor Information Centre, the Smiths Falls Railway Museum and the Heritage House Museum. Originally known as Smyth's Falls, it was named after Thomas Smyth, a United Empire Loyalist who received a 400 acre land grant in the area in 1786. However it wasn't until 1823 that Smyth built the first mill at the falls. Smyth's ownership of the land was contested and he lost it. The land eventually ended up in the possession of Abel Russell Ward who in 1826 actively started to built a settlement. It became known as "Wardsville", but by 1836 was more commonly known as "Smith's Falls". It was this name that was officially incorporated in 1883 (corrected in 1968 as "Smiths Falls"). In the late 1800s the railway came to town and Smiths Falls benefited by becoming the regional railway hub for both the Canadian Northern Railway and the Canadian Pacific Railroad. Boaters going through Smiths Falls will pass under the magnificent Scherzer rolling-lift railway bridge (a type of bascule bridge) which was built in 1912-13 by the Dominion Bridge Company of Lachine, Quebec for the Canadian Northern Railway. The bridge is no longer in service and is now in a permanently raised position. Smiths Falls is also home to the lock with the single largest lift on the Rideau (26 feet - 7.9 m). This lock was built (with much controversy), in 1973-74, replacing the original flight of 3 locks located in the centre of town. The original locks are still there, providing the visitor a glimpse at the inner workings of a Rideau lock. Perth was originally laid out as a military settlement in 1816 to help protect the inland water route connecting Lake Ontario with the Ottawa River, and to act as an administrative centre for settlers in the region. Shortly after the completion of the Rideau Canal, a navigable water connection to the Rideau was established with the building of the Tay Canal. Today Perth is a thriving community with all the modern conveniences wonderfully blended with the charm of an "Old Ontario" town. It is accessible by boat from the Rideau by locking through the Beveridges locks into the Tay Canal which will lead you to the middle of downtown Perth. Portland, the gateway to Big Rideau Lake, was an early settlement along the Rideau. Although land was granted in the area of Portland in 1801, it was not until the early 1820s that a community started to grow in the location of the present day town. An 1818 map shows a trail leading to the location which is named "Old Landing." An 1828 map also shows it as "Old Landing" with more of a substantial road leading to it. Local history credits the first settler on the village site as being Ami Chipman (b.1807, son of Heman Chipman). An 1830 map shows a "small settlement" in this location. The name of the small community was changed to Portland in 1833, in honour of William Henry Cavendish Bentinck, the 3rd Duke of Portland. Portland remained a centre of commerce through the 1800s, serving the commercial boat traffic that plied the Rideau. The business directory for 1866-67 listed coopers, hotel keepers, store keepers, blacksmiths, wagon makers, mitten makers, a watch maker, a miller, and a dentist. When commercial activity along the Rideau slowed down in the early 1900s, the main activity in Portland became a service centre for local residents (including two large marinas). This remains Portland's raison d'être to this day. Westport, a quiet little village with a population of about 700, is a very popular destination spot for tourists due to the number of interesting shops in the town. It was first settled in the early 1800s and was known as Head of the Lake. By 1829 a family by the name of Manhard had built a saw mill and grist mill and the community became known as Manhard's Mills. It was renamed in 1841 as Westport, reflecting its location at the west end of Upper Rideau Lake. The Foley Mountain Conservation Area, located adjacent to Westport, offers a great view of Westport, as well as many opportunities for hiking and nature viewing. Westport also hosts several yearly festivals including the annual Heritage Festival, held in late June, the annual Rideau Valley Art Festival, held at the end of August, and the very popular Fall Colours Studio Tour, held in early October. Newboro is one of the few communities that arose as a direct result of the building of the Rideau Canal. Originally known as "The Isthmus", it marks the watershed divide between waters flowing north to Ottawa and those flowing south to Kingston. The early story of Newboro is that of hard rock and malaria. It was both of these that threatened to defeate Colonel By as he tried to build the canal. It forced By to do some very creative engineering including the construction of two locks that were not originally planned (the lock at Newboro and the lock at the Narrows) . Today Newboro is is a quiet little community, catering to anglers out to enjoy the fishing bounty of the Rideau lakes. It also provides a very popular upscale shopping experience. An early settler, Ebenezer Halladay, began clearing land for farming in the early 1800s. The community that started to grow here became known as Halladay's Corners, linked by road to both Jones Falls and Portland. During the building of the Rideau, a quarry near Elgin became the major source of cut stone for the locks at Jones Falls, Davis and Chaffeys, including the awesome arched stone dam at Jones Falls. Today, Elgin, located just of Highway 15, is the main service centre for area residents, including the many seasonal residents that enjoy cottaging in the southern Rideau lakes area. The rapids in this spot attracted Samuel Chaffey to settle here in about 1820. He dammed the rapids and by the time of canal construction had a grist mill and a carding mill on one bank of the river, and a sawmill and a distillery on the other. Chaffey died of malaria in 1827 and Colonel By bought his property from Samuel’s widow in order to construct the canal. 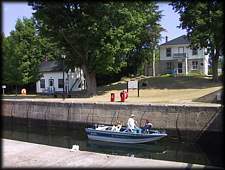 The community name of Chaffeys Locks has interesting historical roots since it refers to the fact that Colonel By originally proposed to place two locks at this location. This would have created a single navigable section from Chaffeys to Poonamalie. But it was later determined that this would have flooded too much land, and Colonel By changed plans to the configuration we see today, a single lock. By the 20th century, Chaffeys became a centre for recreational fishing, supporting a large tourist trade. Every morning would see a parade of fishing guide skiffs heading north to Indian Lake or south to Opinicon Lake. Today Chaffeys still attracts many tourists who enjoy its quiet ambiance. Delta, a quiet village situated on Highway 42, was founded in 1796 by Abel Stevens, a Loyalist settler from Vermont. The most prominent feature of the village, the Old Stone Mill, now a beautiful heritage museum, was built in 1810. The village boasts many examples of beautiful 19th century architecture including St. Paul's Anglican Church which was built in 1811 and is one of the oldest churches in Leeds County. Delta is host to several yearly events including the Delta Maple Syrup Festival, held in mid-April, the Delta Fair, one of Canada's oldest fairs (first held in 1830), held at the end of July, and a Thanksgiving Festival, held on Thanksgiving weekend in October, featuring lots of local produce, crafts, and hot apple cider. In November and December the local park is lit up with thousands of lights as part of Delta's Celebrating the Season event. A quaint rural village, Lyndhurst is home to the oldest bridge in existence in Ontario. The stone masonry constructed three span bridge, built in 1856-57, is still in regular use today. Lyndhurst came into being with the building by Charles Sutherland in 1801 of Ontario's first successful iron smelter. Originally known as Furnace Falls, the village flourished after the building of a grist mill in 1827. In 1851 it was named Lyndhurst, after John Singleton Copley, Baron Lyndhurst. It was the flooding of Cranberry Marsh during the building of the Rideau Canal that formed the geographic bay which was to become "Seeleys Bay". The name comes from the original owner of the land, John Seeley. It was his father, Justus who with his second wife Anne, first settled in the area. The bay became a landing for steamboats plying the Rideau. By the 1850s it had become a regular stop for stagecoachs travelling between Kingston and Perth. Seeleys Bay, as the first full service community north of Kingston, continues today in its role as a stop for visitors travelling the Rideau. It is host to an annual winter festival held in February, known as Frost Fest, celebrating the fun of a Rideau winter. Kingston Mills is a reminder of why the Canal was built. An 1830s blockhouse forms part of the ring of fortifications around Kingston. This blockhouse, a series of Martello towers, and Old Fort Henry, at the entrance to the Canal on Lake Ontario, were built by the British Army to guard against attack from the United States. This threat cost Kingston its chance to be the nation's capital. At the meeting point of Lake Ontario, the 1000 Islands of the St. Lawrence River, and the Rideau Canal, Kingston is a natural jumping off place. There are six exits off Highway 401, as well as by Highway 2 via the 1000 Islands Parkway, Highway 15 from Ottawa, and the Loyalist Parkway ( Highway 33 ). The Ivy Lea Bridge spans the 1000 Islands to U.S. Interstate 81 just 30 minutes east of Kingston. Kingston has topnotch docking facilities: Portsmouth Olympic Harbour and Confederation Basin Marina. The latter is located in the heart of downtown Kingston, guarded by Old Fort Henry. Dating back to the 1600s and the time of Count Frontenac, Kingston has many historic limestone buildings, giving the city its name "The Limestone City". Ottawa, the nation's capital, was originally called Bytown, after Colonel By, the architect and builder of the Rideau Canal. Most major attractions are located downtown. It was founded in 1826 with the building of the Rideau Canal. Follow the Rideau Canal from Hog's Back Falls past the Central Experimental Farm and Arboretum to Dow's Lake. Continue past Lansdowne Park to the National Arts Centre. You will see the Parliament Buildings and the final majestic flight of eight locks on the Rideau, connecting it to the Ottawa River. In the winter, the frozen Canal becomes the world's longest skating rink. Thousands of people skate to work every day, briefcases swinging jauntily from their hands. Winterlude, a festival of ice sculptures and open-air entertainment held in February, takes place throughout Ottawa with a focus on the Rideau Canal Skateway. People are encouraged to build their own sculptures downtown as well, and the parks and open spaces are graced with some of the most imaginative crystalline creations you ever saw. By car, Ottawa can be reached via Highway 15 from Kingston, Highway 7 from Toronto, and Highway 416 from Highway 401 at Prescott. The Ottawa-Ogdensburg National Bridge spans the St. Lawrence Seaway at Ogdensburg, New York, offering easy access to Highway 416.